Technology is advancing at unprecedented rates and the cost of being on the forefront of these amazing technological advancements is more affordable every day. The rapid advancements in technology are reaching developing nations and creating an environment for populations to grow, while medical advancements ensure that people are living longer than ever. As we embrace each new life added to our planet, we must also find a way to harness the advancements in technology into providing more food, at higher qualities than ever before, with dwindling resources, while regulations force conservation of our precious resources and GREEN solutions for waste and pollution. In the dairy industry, dairymen utilize the technological advancements in milking and barn equipment, data tracking software, and in medicine. So, why is the advancement in dairy design and construction seen differently? Why are the same tired designs being reproduced globally? Why can’t designers think “outside of the BOX” and embrace technology to bring a world-class product to the dairy industry? 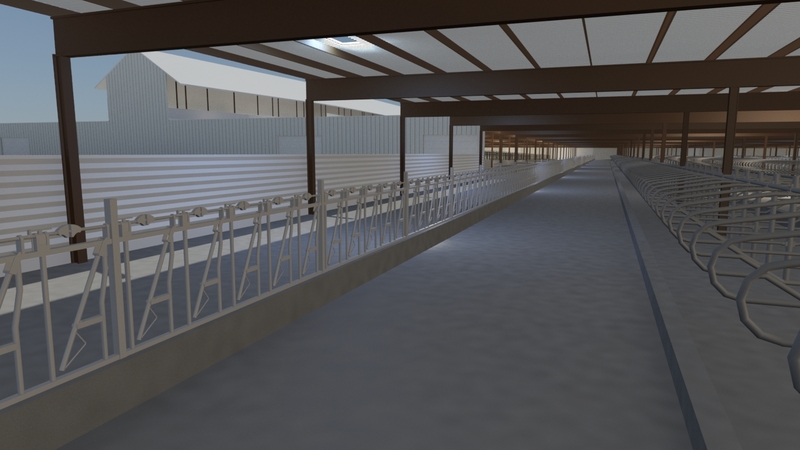 After decades in the dairy design and construction business working with dairymen to help provide them with resolutions to the issues that cost them both time and money, we have designed the solution. GDS’s patented Big BOX Dairy is the solution to the problems that have been plaguing dairymen for decades. The Big BOX Dairy puts the OWNER's needs and wants at the forefront. 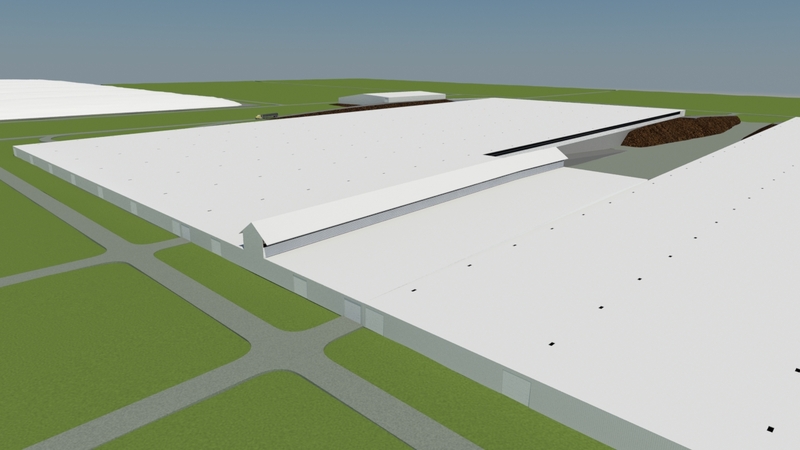 When you take a look at the Big BOX design, you will quickly recognize that the design is based on a Cross-Ventilated dairy barn. We have utilized the Cross-Vent technology and furthered it. A LPCV barn utilizes a 0.5:12 roof pitch; Big BOX uses a monoslope roof, which allows for the control of all precipitation accumulating on the barn's roof. All of this water can be put to good use in the dairy rather than becoming part of the waste stream. The ability to capture and reuse the precipitation the hundreds of thousands of gallons of water (could be millions of gallons, depending on location) adds a GREEN element to the dairy that has not been seen before. Traditional freestall barns and LPCV barns use baffles to help control the airflow, forcing the air down to cool the cattle. Millions of cubic feet of air are being moved that will never reach the cows, wasting resources. 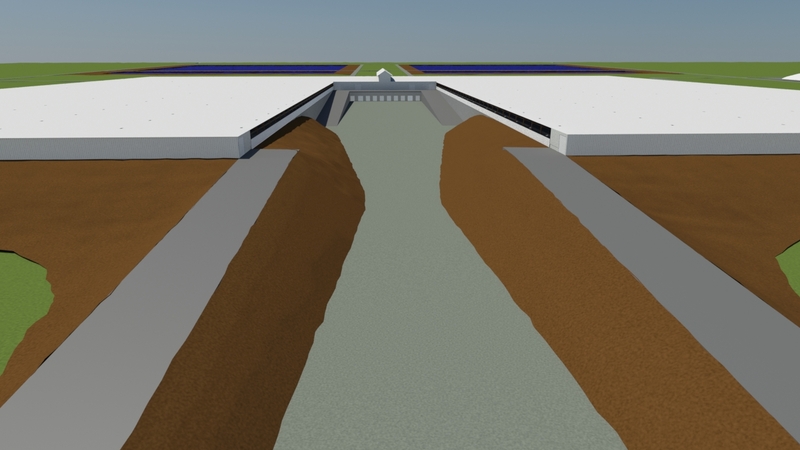 The flat monoslope roof design allows for the dairy to operate at a higher level of efficiency, by having less air to move, and cooling the environment of the dairy, rather than soaking the cow. A cool environment equals cool cows. 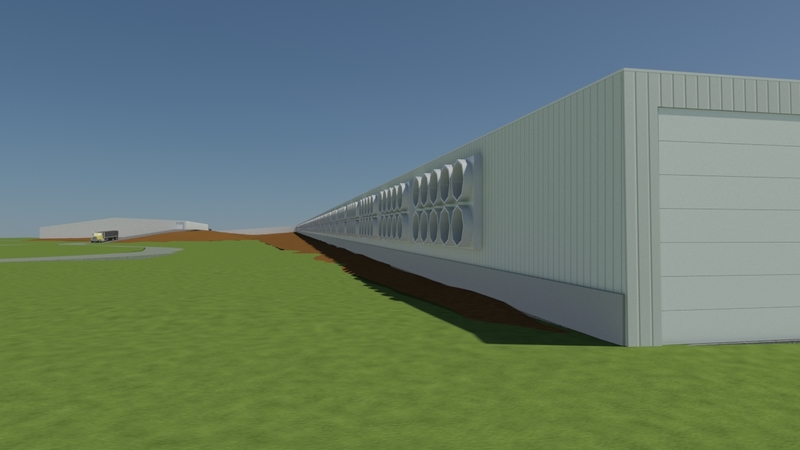 The Big BOX design utilizes a high-pressure misting system technology to cool the dairy. Misters are strategically placed on the roof's air inlet that runs over the parlor and holding pens as well as on the open sidewalls. As the air is pulled through the inlet and sidewalls, the mist cools and humidifies the air. The cooled air is pulled across the dairy at a rate of one air change per minute. This can be increased or decreased by adjusting the speed of the fans on the outlet sidewall. This technology cools the cows by cooling their environment. In climates where extreme humidity is an issue, the MicroMist system can be used in conjunction with a system that soaks the cows during peak hours of heat and humidity. 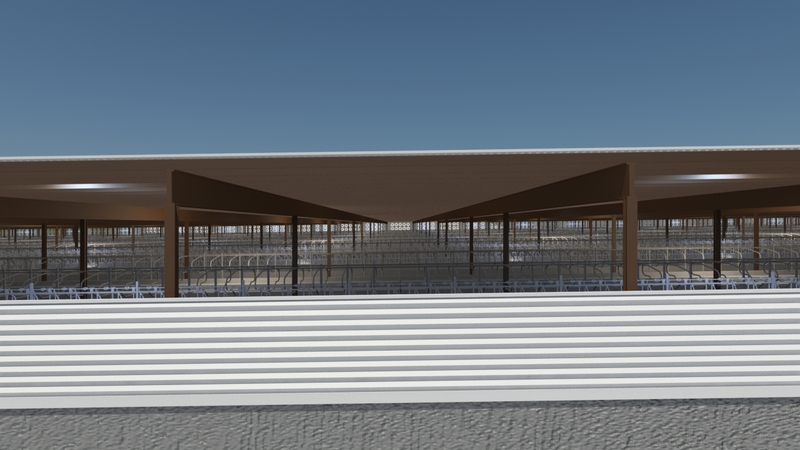 In arid climates, the misting system will cease the need for soaking cows and conserve millions of gallons of water annually, once again adding to the GREEN nature of the Big BOX Dairy. The design of the Commodity Barn is an important feature of the Big BOX Dairy. By housing the commodities indoors, the 5-7% loss due to weather and spoilage is effectively reduced to almost ZERO. Mixing and feeding operations are conducted indoors, which adds to the level of consistency required for feed mixing. The ability to control commodity loss pays for the commodity building in a very short amount of time, and adds another GREEN component to the Big BOX dairy. The bottom line: Building a Big BOX Dairy saves the owner REAL DOLLARS (and a lot of them) in construction cost while providing a dairy that is designed and built with Cow Comfort in mind. GDS is able to do all of this and still provide the GREENEST dairy design available (smaller footprint, fewer construction materials required, precipitation runoff control, maximized energy efficiency). 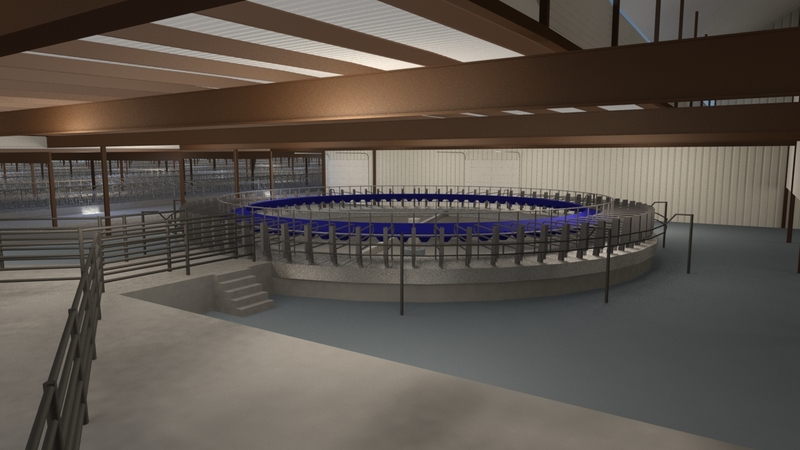 We understand that the Big BOX Dairy isn't for everyone, but if you are the type of owner that likes to have total control of your operation, including the millions of dollars spent during design and construction, then the Big BOX Dairy is for you. This isn't for people who have money to waste or who don't care about how their operation is run. On second thought, the Big BOX Dairy is for EVERYONE.